On the guitar, Phrygian is the third mode of the major scale. It’s the sound that’s created when the 3rd scale degree is functioning as the tonic. Because it features a f3rd and centers on a minor chord, it’s considered a minor mode. Looking at this scale’s construction, Phrygian mode can be thought of as a natural minor scale with a flattened 2nd. In fact, Phrygian’s most defining characteristic is its f2nd. Most Phrygian progressions use the fII chord, as you see in a moment. Here is how to view the fretboard in B Phrygian mode. Notice that these notes and chords are the very same ones you use for G major (or A Dorian, for that matter). The only difference is that the 3rd degree, B, is now the tonic and counted as number 1. If you want to play a Phrygian scale, play 1 to 1. This is just one example of how you can view the fretboard in B Phrygian mode. You can play in any manner you like; it’ll always be B Phrygian mode as long as you use notes and chords from the G major scale and the 3rd scale degree, B, functions as the tonic. You can play in other Phrygian keys by centering on the 3rd degree of other major scales. In order to properly produce the Phrygian sound, you need to hear the G major scale notes played against a chord progression that centers on the 3rd degree, B, as you see here. This iii-IV progression in G major becomes i-fII when you number from B. You can play along with G major scale notes to produce the sound of B Phyrgian mode in B Phrygian Play-Along Track. Because Phrygian mode centers on a minor chord, most lead guitar players prefer to approach it with minor pentatonic scale patterns. You can see how to put together B minor pentatonic and G major scale patterns here. 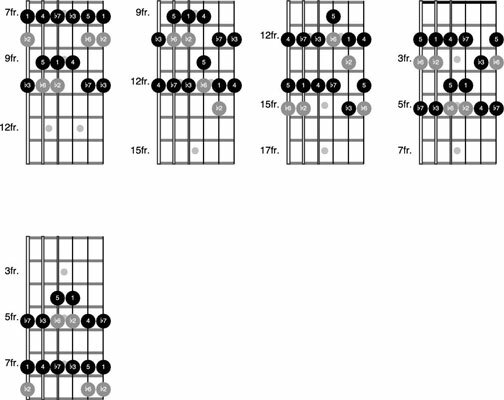 You can think of Phrygian mode as being the minor pentatonic with an added f2nd and f6th.What’s nice about combining patterns this way is that you can stay in familiar pentatonic boxes and simultaneously incorporate major scale notes to produce the full Phrygian sound. Keep in mind that you don’t need to memorize and master every one of these pattern combinations. You can settle on just a few. 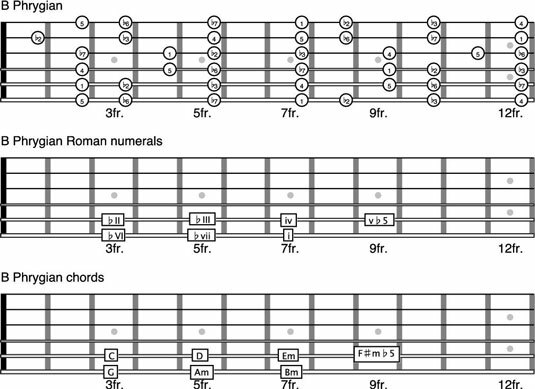 As a starting place, you can play through B minor pentatonic pattern 1, beginning at the 7th fret (the first diagram). Notice that instead of having you play past the 15th fret for pentatonic patterns 4 and 5, you are positioned an octave lower on the fretboard. The key of B Phrygian is just a starting point. You can produce Phrygian mode in other keys by combining the patterns in this way in new positions. For example, move up the patterns one fret to play in C Phrygian, then two more for D Phrygian, and so on. Note that E Phrygian is drawn from the C major scale. Any one of these songs is good for playing along with and practicing Phrygian mode. You can also put together your own tracks by centering a progression around the 3rd degree and chord from the major scale. As you can tell from the preceding song examples, Phrygian has a dark and slightly Spanish sound quality to it.